UPDATE 1045 GMT: Pro-Assad warplanes are bombing outside Jisr al-Shughour in northwest Idlib Province. The Assad regime’s allies Iran and Russia have both maintained the drumbeat for an invasion of Idlib Province in northwest Syria, the last major opposition area in the country. 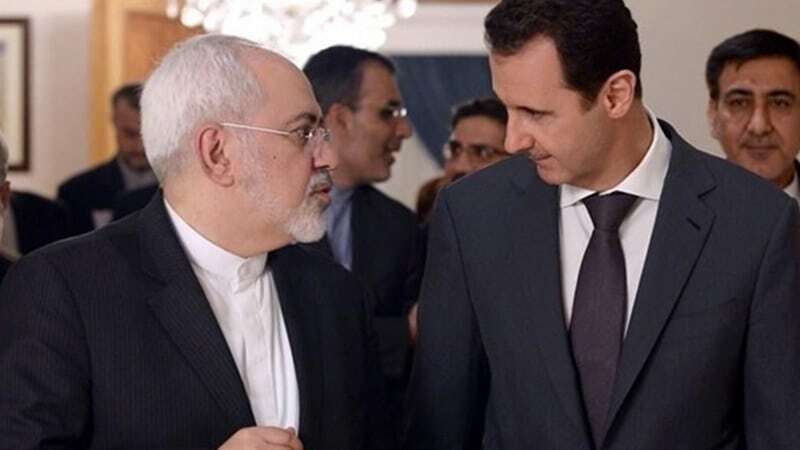 Iranian and Syrian State media gave no details of Zarif’s discussion with Assad, printing platitudes such as “Western pressure on Tehran and Damascus will fail to deter them from fighting terrorism”; “the current level of relations between the two countries in various fields”; and “consultations and coordination, particularly in the light of the rapidly-shifting regional and international issues”. Meanwhile, Russian Foreign Minister Sergei Lavrov repeated his declaration that the Assad regime has the right to “liquidate terrorists” and said the situation cannot be tolerated indefinitely. Last week, Lavrov said rebels in Idlib were a “festering abscess” which had to be removed. Russia, Turkey, and Iran declared a “de-escalation zone” for Idlib, western Aleppo, and northern Hama Provinces last year. However, Moscow and Tehran have used the tactic elsewhere to support pro-Assad offensives, breaking the zones — in the name of removing “terrorists” and “extremists” — in areas such as East Ghouta near Damascus and across southern Syria. To rationalize attacks in the northwest, Russia, Iran, and the Assad regime have been pushing out disinformation such as claims that rebels and White Helmets rescuers are preparing a “false flag” chemical attack. This would be followed by US, British, and French strikes on Assad regime positions. In fact, it is the Assad regime and Russia who have been building up forces for an assault, with Moscow moving 10 missile-armed warships to the eastern Mediterranean off the coast of northwest Syria. The greatest deterrent to an invasion has been Turkey, which twice held out against an offensive in meetings with Lavrov last month. Ankara’s forces moved into northwest Syria alongside rebels from August 2016, pushing out the Islamic State and then taking over much of the Kurdish canton of Afrin. Turkey maintains a ring of 12 observation posts around Idlib, western Aleppo, and northern Hama. Israel bombing many SAA locations right now. Seems Israel has green light to do as it wishes vs SAA and Irgc. But on a much larger scale. Meanwhile Trump has also refused Nouri al Malki as the president of Iraq to lead the parliament under Prime Minister Haidar Al Abadi. Which means American is also refusing Iranian hands in Iraq and not just Syria. Iran is backed into a corner now and none of its militias have a helper. As you can see the Russian Air defense has given the green light to bomb Iranian weapons heading to Hezbollah and the rest of the IRGC funded militias at will. Even if Idlib gets started and finished. Russia and America have cut a deal with the Arabs and the rest of the World that Irans game is up. Turkeys game is up too. Normally Iran would look to Turkey for money laundering to get it out of its economic rut, and the rest of Europe would get cheap steel and goods from Turkey that would actually be part of a deal Erdogan has cut with Iran. the new sanctions didn’t leave a stone unturned it seems. Trump made sure Europe isn’t going along with any Erdogan plan to help Iran under the table. I think the arabs will lets the extremists in Idlib get killed and let the Iranians and Bashar do it. The thinking may be that a lot of them wouldn’t be functioning members of a new peaceful Syria, so no harm if they let them fight it out and die since Syria is so excited to do it. After Idlib it will be game over though. Bashar has not won, Russia has won and Russia will make this very evident. I foresee a deal cut to either remove him from power or to have him ask the Iranians to politely leave. Bashar and the alewives need the surrounding arabs more than Iran if they can have a sense of stability as they are a minority in the region. The emirates will be the first nation that reaches out to him. They will offer him reinstatement to the arab league if he outs Iran and Hezbollah. Also look for November to put a coffin in Irans economy even more and then look for them to sell Bashar for economic rescue from Russia and America. They know Bashar will sell them at some point for the rebuilding money he needs. So the Iranians will try to beat him to the punch i think. They would be foolish to try to stay and run the show when they know they are getting pounded by Israel on a weekly basis and their economy is tanking at home. Israel will still have free hand in Syria to clean up Hezbollah and others even if Iran goes because the Iranians are kings at lying. They may announce they are leaving but say that Nasrallah is refusing to leave. Turkey will get its arm twisted hard by the Kurdish problem. The Turkish Kurds may finally unite with the Iranian Kurds during the next phase of the new middle east. Syria will be done with a new presidency, Iran I see could be taken over by Qassem Suleimani in the way that Nasser took over Egypt. Iran could become a military run state instead of a religious extremist state. Suleimani will probably cut deals and deal with securing borders and the new possible Kurdish breakaway. This will be a interesting period. The talk will be about why or why not a Kurdish state. Syria was interesting because of all the parties involved. But the only reason it happened was because Obama liked to play all sides. He used Syria as a bargaining chip in the worthless deal with Iran. He built up the muslim brotherhood in Syria with the help of his buddy Erdogan and they also built up ISIS together and used these as chips to keep the war in Syria running and trade the wins with Iran for more deals on its nuclear sites and oil. Iran sat down with John Kerry and they redrew a map where Saudi was cut in half and the East all the way down to Yemen and the Houthis were now Iranian territory. NEW middle east. Obama simply wanted to avoid attacking Iran lest he be seen as a war mongerer like Bush before him, and the wily Iranians sold him a bigger rug with even more silk and work put into its fabric. The Obama vanity and ego let the Iranian state kill about half a million Syrians and displace millions more and he still got a worthless deal. He did the same with the GCC and Egypt in the face of the Erdogan supported muslim brotherhood. He allows the Turkish Qatari chaos and excitement all until it was obvious it wasn’t going to turn into a war for profit like it did in Syria. Look at Basra news and the Iranian economy. Look at the Israeli bombings in Syria. Look how quiet the kurds are lately (they did not forget their referendum) and look how Erdogans usually loud mouth is also quiet while his Lira is threatened. Big things are brewing in the undercurrent.